When I asked by someone on, “What is your favorite old anime series?” I would answer “Gundam series.” During my childhood it wasn’t that popular in US, but after the Gundam anime series was aired around the end of 20th century, many fans appeared. 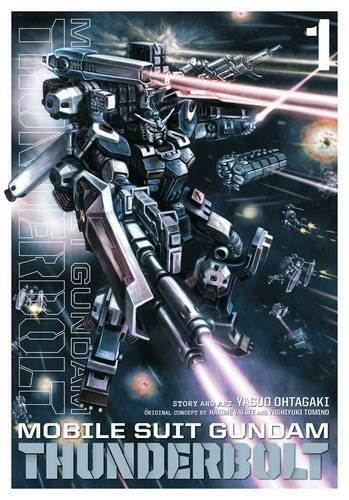 One of the newest Gundam manga that I personally love is the “Gundam Thunderbolt.” The story of this manga is place in the Universal Century Gundam series but in a different line with the Origin. Someone who is great fan would like this manga because the misery of the war and extreme content exceeds the Origin. Not only I read manga or watch anime, building Gunplas (Plastic model kits of Gundam series) is my favorite hobby. As a matter of fact, I have more than 30 Gunpla Model displayed in home! He has been working at Kinokuniya New Jersey since 2015 as NJ store manager. If you are looking for him, he can be spotted at Japanese Comic and Anime Merchandise section!